89 parts in light grey styrene, 4 clear parts, and one decal sheet with markings for 4 schemes. 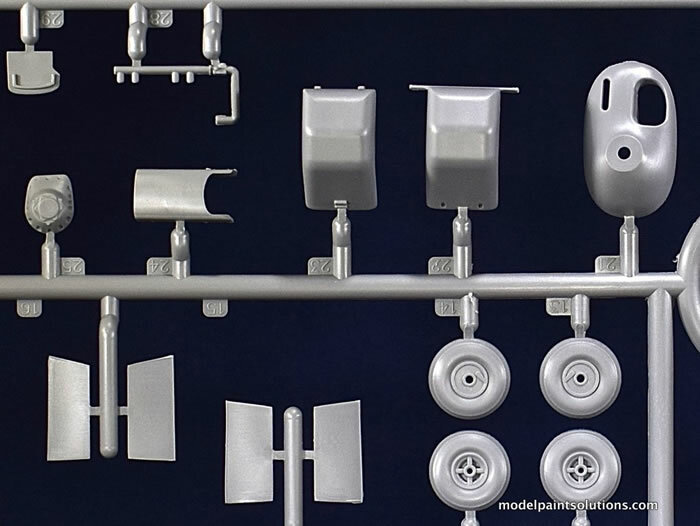 Nicely done surface details and textures; low parts count; straightforward simple assembly. This is a very nice kit of an attractive and historically significant airplane. The moldings are beautifully done and the parts count is low. 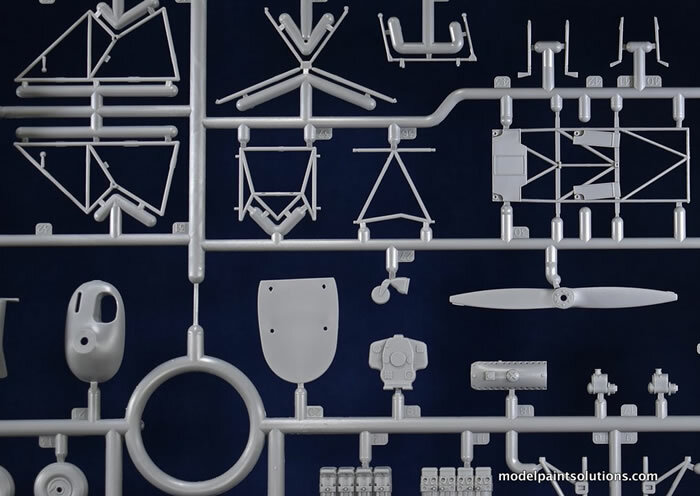 Combine that with the simple engineering and straightforward assembly and you’ve got a great kit for the first-time, big-scale biplane builder. The Bucker Bu 131 "Jungmann" (Young man) was a German 1930s basic training aircraft used by the Luftwaffe during World War II. After serving in the Kaiserliche Marine in World War I, Carl Bucker moved to Sweden becoming the managing director of Svenska Aero AB (not to be confused with Svenska Aeroplan AB, SAAB). He later returned to Germany and started the Bucker Flugzeugbau GmbH: founded in Berlin-Johannisthal in 1932. 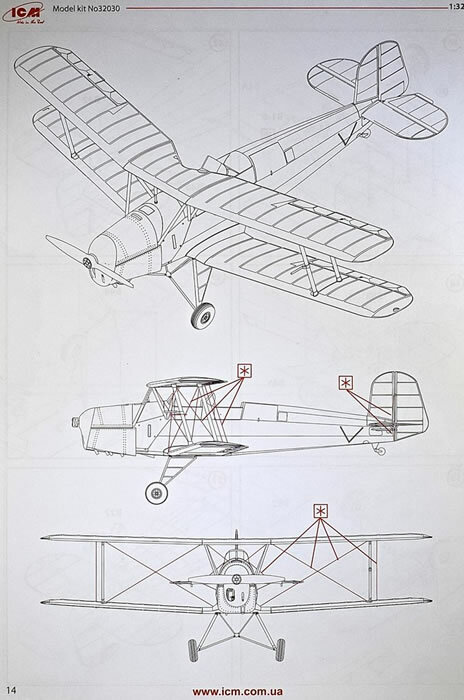 The firm’s first aircraft to enter production was the Bu 131 Jungmann. The Bu 131A had two open cockpits in tandem and fixed landing gear. The fuselage was constructed of steel tube covered in fabric and metal while the wings were wood and fabric. The Bu 131A was equipped with the 80 hp (60 kW) Hirth HM60R. In 1936 the Bu 131B was introduced with the more powerful 105 hp (78 kW) Hirth 504A. 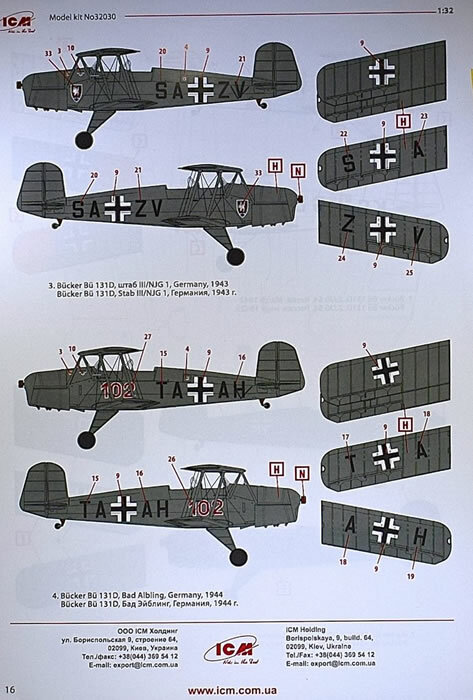 Wartime production of the Bu 131 for the Luftwaffe was performed by Aero in Prague. Sturdy and agile, the Bu 131A was first delivered to the Deutscher Luftsportverband (DLV). 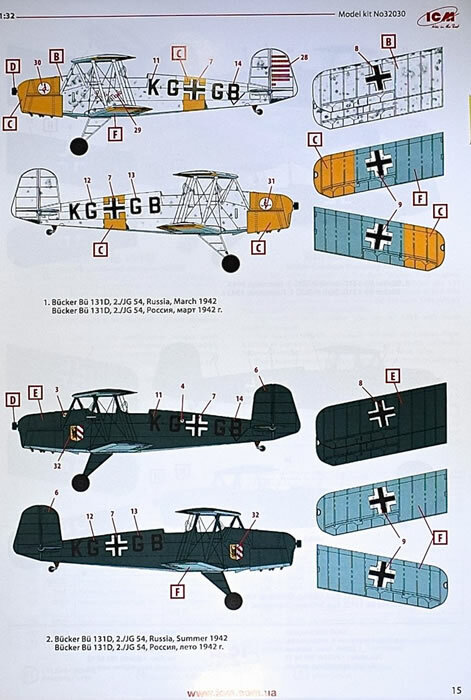 The Bu 131B was selected as the primary basic trainer for the German Luftwaffe, and it served with virtually all the Luftwaffe's primary flying schools during the war, as well as with night harassment units such as Nachtschlacht Gruppen (NSGr) 2, 11, and 12. Other wartime operators include Yugoslavia, Bulgaria, and Romania. Production licenses were granted to Switzerland (94), Spain (530), Hungary (315), and Czechoslovakia (10). Japan built 1,037 for the Imperial Japanese Army and 339 for the Japanese Naval Air Service (IJNAS). In Spain, production continued at CASA until the early 1960s and served as the Spanish Air Force's primary basic trainer until 1968. In the 1960s and early 70s the Spanish, Swiss and Czech governments sold their Jungmann’s to private owners with many being exported to the United States. About 200 Jungmann’s survive to this day, many having been fitted with modern Lycoming O-320 (150 hp) or O-360 (180 hp) four cylinder engines with inverted fuel and oil systems for aerobatic flight. Current owners and pilots prize the Jungmann for its outstanding handling characteristics when compared to other antique bi-planes and even more modern aerobatic types. Upkeep and maintenance for the Jungmann is comparable to other antique aircraft and is superior when fitted with Lycoming engines. 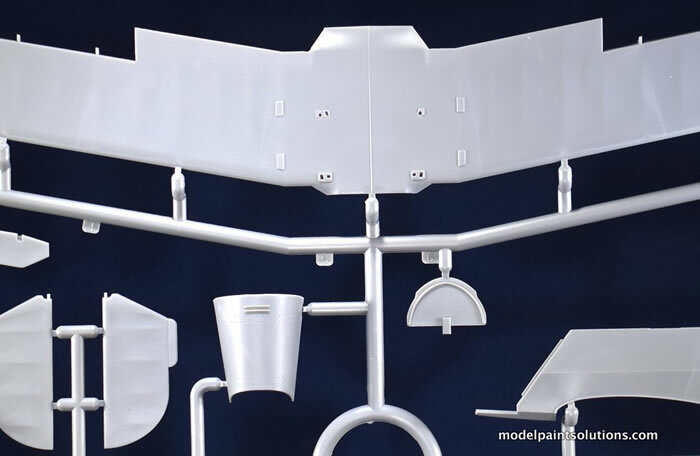 Airframe parts are available from several sources both in the United States and Europe. Two-seat primary trainer biplane. Initial production version. Improved version, powered by the more powerful Hirth HM 504A-2 piston engines. Experimental version, fitted with 67 kW (90 hp) Cirrus Minor piston engine. One built. Final German production version introduced in 1938. As with a 1:1 Jungmann, this 1/32 scale version is surprisingly small but has a good bit of detail right out of the box. ICM have done a commendable job with the inscribed details, surface textures, and overall engineering of this kit. Well done, ICM. Keep ‘em coming! 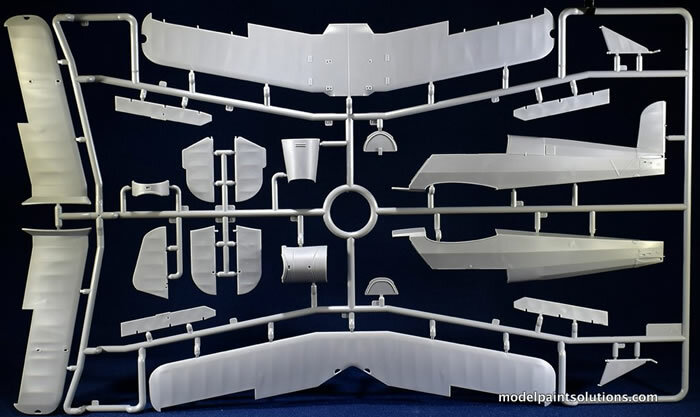 Three sprues carrying 89 light grey styrene parts and 4 parts in clear plastic comprise the kit. 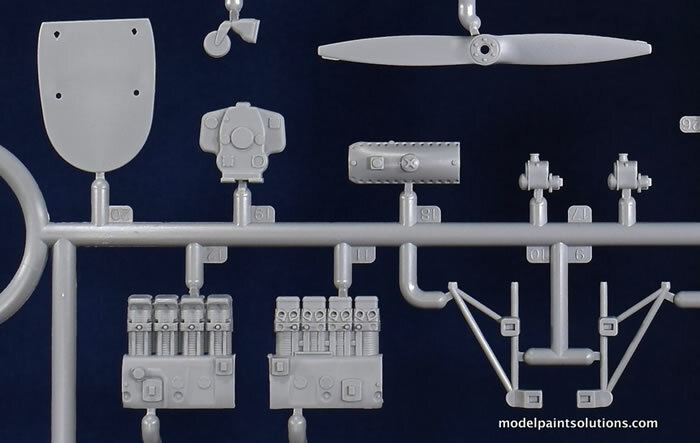 For a 1/32 scale biplane the parts count is surprisingly low. The surface details, especially the fabric textures, are nicely done and scale appropriate. 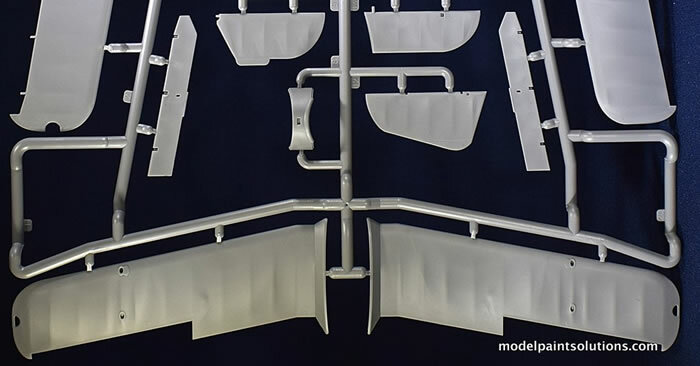 Despite being a limited-run kit, the sprue gates are small facilitating damage-free separation of the parts from the sprues. 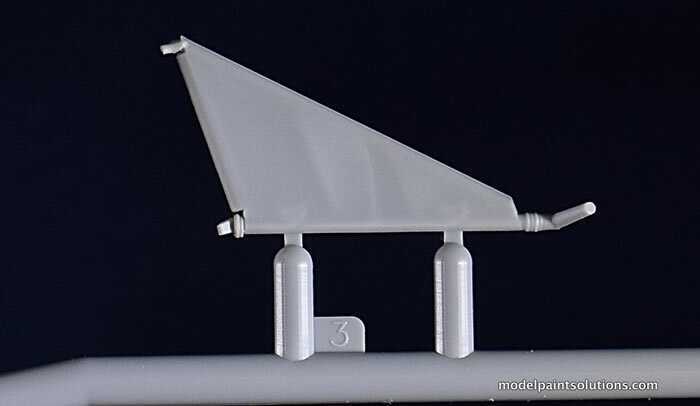 Construction begins by affixing the upper wing halves onto the full-span lower wing and adding the single-piece, poseable ailerons. 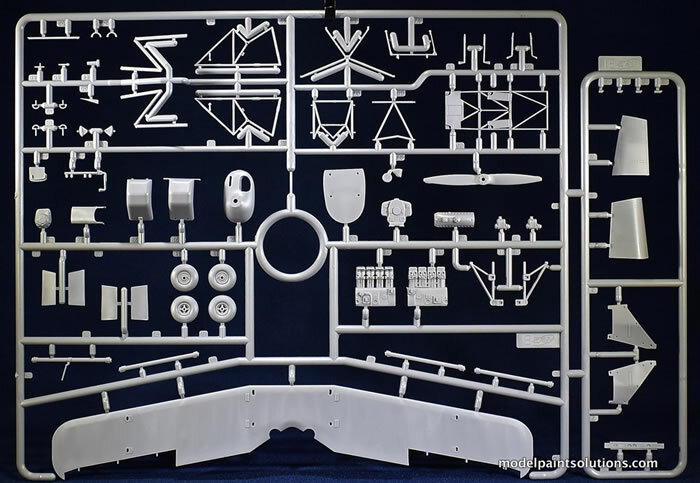 Next, the nicely detailed cockpit floor composed of steel-tube framing is assembled onto the lower wing center section. Continuing with the cockpits, nicely molded throttle quadrants are added to additional pieces of tubular framing, which are then glued into each fuselage halve. Super detailers are going to have a blast as both the front and rear cockpits have sizeable doors that can be posed closed or open. That being the case, details of the front and rear offices will be very viewable from either side of the completed model. 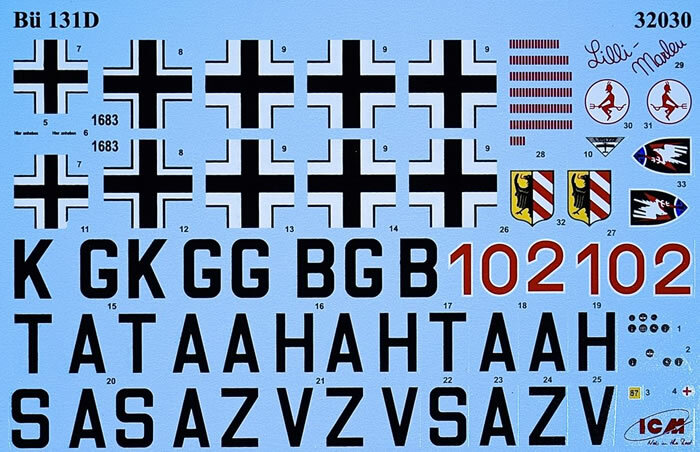 The nicely detailed instrument panels are molded in clear styrene and the instrument faces are provided as decals. The combination should be quite convincing. Concurrent with assembly of the fuselage the instructions direct the builder to assemble the Hirth 504A. 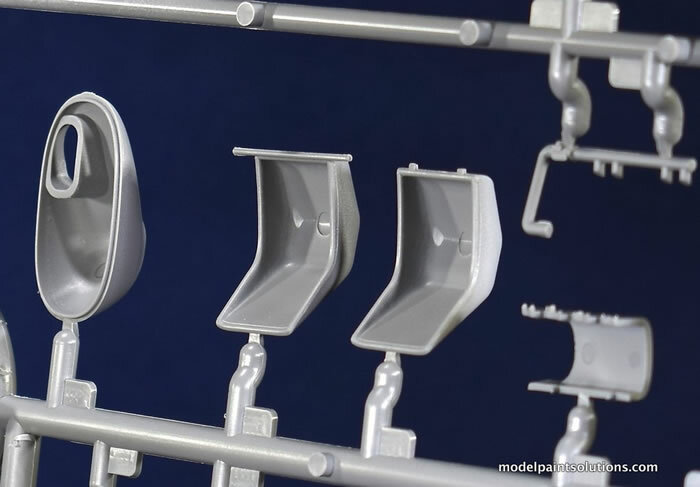 Much like the cockpits, those with a penchant for detail will be tempted to add to what is already a nicely detailed engine and pose the model with one or more of the cowls open. Once the engine, complete with well-detailed bearers, is joined to the firewall, the addition of multiple nose cowl pieces, nose bowl, cockpit side doors, and horizontal stabilizers is completed next. 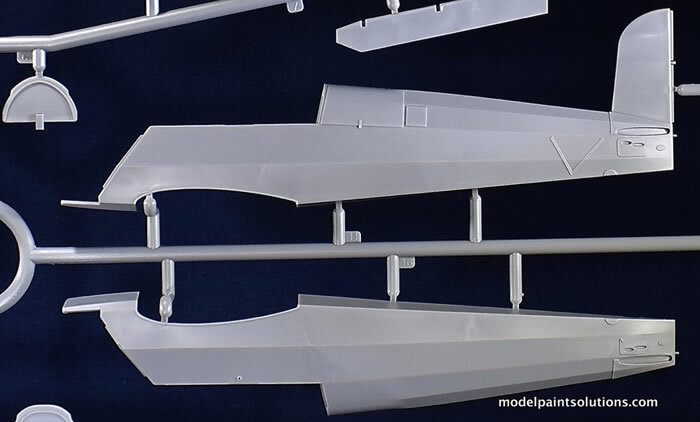 With the fuselage mostly assembled, the upper and lower, full-span halves of the upper wing are joined followed by single-piece, poseable ailerons. At this point the instructions suggest you add the interplane and cabane struts to the upper wing then join this assembly to the fuselage/lower wing. Since the strut attach points aren’t keyed (facilitating the appropriate angle) I suspect the builder will have use an alternate method for this step. Addition of the single-piece and poseable elevators and rudder are next in sequence followed by the nicely detailed landing gear assembly. The landing gear struts and x-shaped center support are nicely molded, as are the wheels, which are assembled from halves. 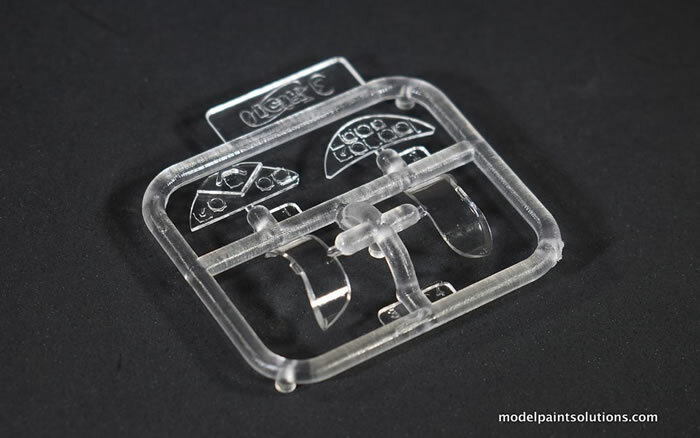 The clear parts, which include the windscreens and instrument panels, are crystal clear and nicely molded. A nice inclusion is the detailed diagram showing the rigging clearly marked in red: very handy. With such straightforward and simple engineering this should be a very enjoyable build. I see no potential issues that shouldn’t be handled with a bit of patience. Aircraft (KG+GB) is overall white distemper with underlying darker color (probably RLM-71) showing through. Undersides are RLM-65 (light blue) with RLM-04 (yellow) on underside tips of the lower wing, nose, and waistband. 2) Bucker Bu-131D, 2/JG54, Russia, summer 1942. Same aircraft as above (KG+GB) in the summer with overall RLM-71 (Dark Green) uppers with RLM-65 (Light blue) lowers. 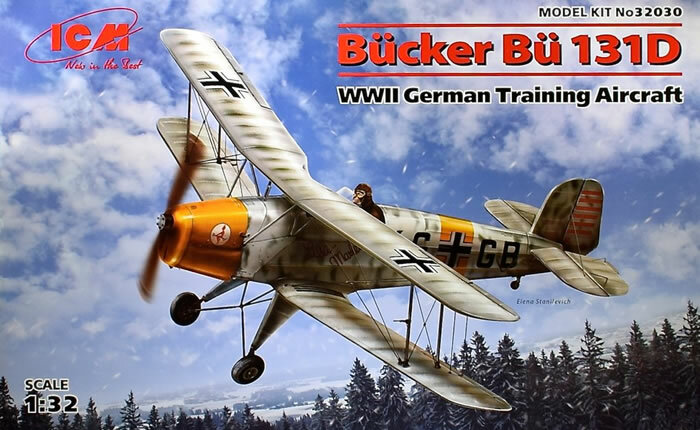 3) Bucker Bu-131D, Stab III/NJG 1 Germany, 1943. Aircraft (SA+ZV) is overall RLM-02 (gray). 4) Bucker Bu-131D, Bad Aibling, Germany, 1944. Aircraft (TA+AH) is overall RLM-02 (gray) with the number “102” in red with white outline on the both sides of the fuselage. This is a very nice kit. The surface textures and inscribed details are scale appropriate and restrained. The parts count is low, the engineering is simple, and the building sequence is straightforward. This would be a great model for someone’s first foray into large-scale biplanes. For those inclined to detailing, the dual cockpits and engine compartment give ample opportunities to add to what is already a nicely detailed model. Highly Recommended! For more on this review visit Modelpaintsolutions.com. Thanks to ICM for the review sample.